November is almost over. Where did the time go? It already feels like winter outside, and I don’t think I’m prepared! If you’re anything like me, you’ve once again waited until the last minute to cast on those crucial knits you’ve been promising all year. There’s no need to panic. I’ve got just the thing for you. If you’re looking for quick knitting projects that can double as the perfect last minute knit for the holiday season, why not cast on a pair of knitted slippers? These cozy knits are a definite winter must-have for anyone. After all, you can never have enough pairs of slippers. With everyone home for the holidays, it isn’t uncommon to hear the soft pitter patter of feet across the floors. 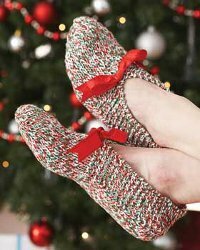 Keep those toes nice and toasty this year with these knit slippers patterns made with the holidays in mind. From cozy knits featuring traditional Christmas colors to slippers just like Grandma used to make, you’re sure to find something here for everyone in the house. If you’re not quite ready to give up on your straight knitting needles, you can still join in on the fun of knitting slippers for the holidays. These patterns are designed to be worked flat and seamed together in the end for a warm and cozy knit anyone would love to receive. Mittens aren’t just for children anymore! Now, I know what you’re thinking. What do mittens have to do with slippers? Think of it this way: mittens are really just slippers for your hands. They keep those mitts (yes, pun intended) nice and warm all winter long. What makes these patterns even better is that you don’t have to be a professional knitter to learn how to knit mittens in time for the harsh winter weather to come. With mitten patterns ranging in skill level, there’s sure to be something here for everyone— from the most novice of knitters to the most experienced. Knit in the round, the finished product will be a beautifully seamless pair of mittens you’re sure to turn to year after year. So, what are you waiting for? Cast on a pair or two (or three!) for you and all of your loved ones. I’m sure everyone will be very appreciative of the extra layer of warmth.